Multi-channel marketing requires thoughtful tracking and measurement. For a single campaign, a marketer will use social media, email, display advertising, search advertising, media buys, and more to drive interest and conversions. All of these online channels result in varying levels of performance. To determine which channel is the most effective, there needs to be a clean and clear way to track results in order to make informed choices on where to spend time and money. While there are several analytics tools out there, for many, Google Analytics is the go-to tool for tracking and measuring online performance. When using Google Analytics, incorporate UTM parameters into your strategy. The term UTM stands for Urchin Tracking Module and is the format that Google uses to track unique URLs. Here, I discuss the basics, benefits, and best practices for using UTM parameters in organic search marketing efforts. Simply stated, UTM parameters are snippets of text added to the end of a URL to help track the performance of your online content. When defining the campaign parameter it is necessary to consider your measurement goals. What do you want to measure? Do you want to see how a service or product performs? If you are a content marketer, do you want to see how different topics or authors perform? If your business is seasonal, are you trying to measure a holiday campaign? Explore these questions to define how your Campaign Parameter is structured. Source is the specific location where you are publishing the promotion. There are two other parameters that can be used — content and term. Both are primarily used for PPC campaigns. Once you have determined the structure of your parameters, create a spreadsheet that defines and standardizes the process. Everyone on your marketing and advertising teams should have access to and an understanding of the parameters. This will ensure that your tracking and measurement is consistent. Now that the parameters are defined, links need to be built! There are a number of ways to do this — excel spreadsheet, online tool, or by hand. I recommend using an online tool. These are some of the best tools I’ve found. …and my personal favorite, the Google Analytics URL Builder chrome extension. This handy extension allows you to build a URL from the page displayed in your browser. Quick sets can be defined, to avoid the tedious task of typing in each of the parameters every time a link is built. It also integrates with Bit.ly. This enables URL shortening and additional tracking. This handy tool can be found in the Chrome Web Store. 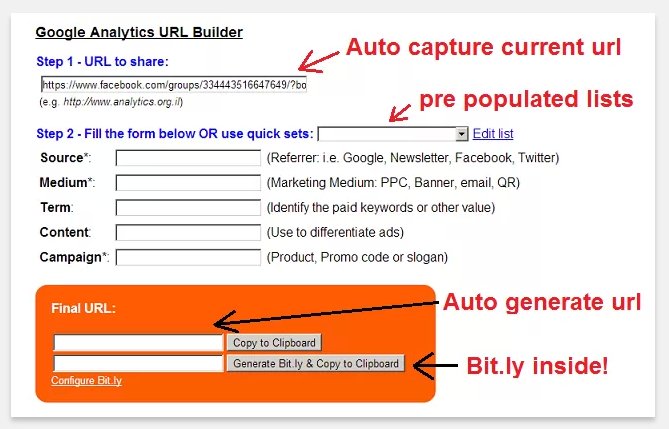 After integrating UTM parameters into your marketing strategy, the results will begin showing in Google Analytics. You can view and analyze the results of your campaigns and various marketing channels by digging into the data. It is important that your site be configured for conversion tracking in order to see and report actionable results. Combining UTM parameters and conversion tracking provides a holistic view of marketing performance. This is a great article about UTM parameters that provides instructions on where to view results in Google Analytics. Use the results to narrow down which campaigns drive performance. Refine your product, services, and/or content strategy accordingly. Then, dig into the performance of the channels (source/medium). If social doesn’t appear to be driving conversions, don’t spend money there. If you’re not already, start using UTM parameters today. I promise, they will improve your ability to respond to and improve your marketing efforts immensely.